There’s a case to be made that director Billy Wilder is the pre-eminent filmmaker of the twentieth century (albeit an assertion that can be challenged by any number of other, equally-superlative directors). The cornerstone of this claim is that the content and subject matter of Wilder’s work is fundamentally informed by the key social and historical movements of the American Century, the most influential of which being the human drama of World War II’s European Theater. While he didn’t serve in combat operations, his heritage as an Austrian Jew placed him in the unenviable position of having to flee his homeland during Adolf Hitler’s rise to power, and subsequently losing members of his family to the dictator’s horrific concentration camps. Most of his films– even the crowd-pleasing comedies– bear the psychological scars of this era. When he chose to tackle the conflict head on, in films like FIVE GRAVES TO CAIRO (1943) or A FOREIGN AFFAIR (1948), his sharply-honed wit was at its most incisive. By 1953, America had already moved on from the conflict and prospered in peacetime, only to entangle itself in another conflict– The Korean War. But back home, our collective consciousness was still grappling with the psychological fallout, still fighting long-concluded battles in the forum of pop culture. Having just come off the sobering disappointment of his 1951 film ACE IN THE HOLE, Wilder found himself in New York City, taking in a play called “Stalag 17”. Written by real-life POWs Donald Bevan and Edmund Trzcinski, the play chose to depict the conditions of Nazi prison camps from a humorous perspective– a decision that struck a chord with Wilder. Realizing that the story would make for a great film, Wilder acquired the rights and set about adapting the play for the screen with Edwin Blum. The resulting film, STALAG 17, would produce yet another hit for the perennial awards-favorite director while restoring the luster he lost amidst ACE IN THE HOLE’s unfavorable reception. Like the play upon which it’s based, STALAG 17 takes place in the titular Nazi POW camp located deep in the Austrian countryside. American soldiers that have been captured alive are gathered here, languishing in wait for war’s end. Wilder establishes the conditions via a particularly meta voiceover from a minor character named Cookie (Gil Stratton). Cookie knows he’s narrating a film, beginning by bemoaning how tired he is of seeing movies about combat operations and expressing his desire to see more stories about prisoners of war. The titular Stalag 17 has divided the prison population into individual barracks according to rank– a curious move that destroys the disciplined hierarchy of the military establishment, making it so that no man can pull rank over another another. In the bunkhouse assigned to American sergeants, the prisoners deduce that there’s a spy in their midst after two of their own are ambushed and shot dead during an escape attempt gone awry. The unity these men should be feeling as brothers-in-arms is suddenly compromised by their open suspicion and hostility of each other. The bulk of the suspicion falls squarely on Sgt. JJ Sefton (William Holden), a loner who isn’t well-liked by the others on account that he’s chosen to cooperate with the Nazis for his own self-gain. At the same time, an Air Force pilot named Lt. James Dunbar (Don Taylor) has been brought into the camp under charges of sabotage. Dunbar faces certain death if the men don’t help him escape, but in order to do so successfully, they’ll need to find the snitch. If he’s going to uphold his commitment to the Allied cause, Sgt Sefton realizes he must actively help his fellow prisoners figure out the true identity of the barracks spy in order to save Dunbar’s life. STALAG 17 re-teams Wilder with his SUNSET BOULEVARD (1950) star William Holden, who would go on to win the Academy Award he felt he deserved from the last time they worked together. Holden’s Sgt. JJ Sefton is clearly meant to be the everyman protagonist, but his characterization operates slightly askance, standing firm by his own individualistic code even when he’s disliked for it. The character is quietly arrogant and stubborn, interested only in his own self-advancement. His disregard for his fellow prisoners is callous and unsympathetic, but it’s ultimately what makes his final transformation towards helping Lt. Dunbar so affecting. Wilder knew the emotional payoff of his story depended on this dynamic, so he repeatedly rebuffed Holden’s attempts to make the character more likable. This intention to fly in the face of studio convention is further signified in Don Taylor’s casting as the captured Air Force officer, Lt. James Dunbar. Taylor effortlessly embodies the part of a virile, masculine hero with movie-star looks– indeed, if STALAG 17 were made by anyone else, Taylor’s Dunbar might very well be the central protagonist rather than a supporting co-star. While the crux of STALAG 17’s denouement may revolve around him, Taylor’s character is ultimately a narrative device that enables the fulfillment of Holden’s own emotional trajectory. In keeping with his tradition of casting other Austrian film directors in minor roles (see Erich Von Stroheim’s appearance inSUNSET BOULEVARD and FIVE GRAVES TO CAIRO), Wilder casts director Otto Preminger as the commander of Stalag 17, Oberst Von Scherbach. Von Sherbach is a cheery tyrant who delights in the misery of his charges, all the while taunting them with patronizingly optimistic platitudes. Preminger (who was already well-known for playing Nazis in other films) excels in the role– an ironic notion considering how uneasy he, a fellow Austrian Jew like Wilder, was with the whole idea. Von Sherbach’s most valuable ally in the camp is the man who is eventually revealed to be the barracks spy, played by Peter Graves. An undercover Nazi who easily passes for the blonde, All-American type, Graves goes by the assumed name Sgt. Frank Price, aggressively leading the witch hunt for the snitch in a bid to cover his own tracks. His deception is brilliant and disciplined, and he’s only revealed to be a spy when he lets slip a crucial inconsistency about the timing of Pearl Harbor. A motley crew of character actors fill out Wilder’s supporting cast, with Robert Strauss’ boar-ish performance as Animal– a prisoner possessed of a debilitating obsession with Betty Grable– given a nod by the Academy in the Best Supporting Actor race. Harvey Lembeck plays Sgt. Harry Shapiro, a fast-talking wiseguy who forms the other half of the barrack’s jester court along with Animal. Finally, Richard Erdman and Neville Brand put in notable performances as Hoffy the barracks chief and a greasy hothead named Duke, respectively. STALAG 17 marks Wilder’s first and only collaboration with Oscar-winning cinematographer Ernest Laszlo, who slings some palpable grit and grime onto Wilder’s otherwise unadorned 1.37:1 35mm film image. While Wilder’s films aren’t necessarily noted for their visual style, they’re usually of impeccable craftsmanship and quality. STALAG 17 is no different, with Wilder’s expressive noir-inspired lighting setup maximizing the black-and-white format’s potential for stark, monochromatic beauty. His visual approach is always in service to the performers, and his compositions reflect this in their muscular economy. In STALAG 17, Wilder covers the action primarily with masters that rely on strategic ensemble staging, deep focus, and motivated camera movement instead of simply cutting to close-ups and other types of coverage. Notably, Wilder made the unconventional choice to shoot the film in sequence– a decision that, together with withholding the last few pages of script from the cast, maintained the secrecy of the plot twist throughout production and allowed for more-realistic expressions of surprise when it came time to shoot the big scene. Wilder’s scheduling of the shoot in this manner is indicative of the priority he placed on writing and performance, but the decision is also reinforced by his preference for the controlled conditions of a studio set. Towards this end, STALAG 17 was filmed on Paramount soundstages, while a ranch in Calabasas stood in for the rural Austrian exteriors. Production designers Hal Pereira and Franz Bachelin were able to replicate the grimy, muddy conditions of POW camps on the soundstages, reportedly to such a degree of detail that executives became extremely uneasy about how it might impact the film’s financial prospects. A few familiar faces round out the rest of Wilder’s key department heads, including mentor Doane Harrison supervising an edit by George Tomasini, and composer Franz Waxman, who turns in an appropriately militaristic score comprised of horns, snare drums, and frequent reprisals of the folk hymn “When Johnny Comes Marching Home”. Whereas many directors of the era were considered pioneers for their innovations in visual style, Wilder chose instead to blaze trails with the content of his narratives. Just as he established the conventions of film noir with 1944’s DOUBLE INDEMNITY, so too did STALAG 17 formalize the tropes of the midcentury POW film– a subgenre that would later claim such iconic films as THE BRIDGE ON THE RIVER KWAI (1957) and THE GREAT ESCAPE (1963). Despite his relatively straightforward visual aesthetic, Wilder’s barbed wit distinguished him from his peers, affording him the courage to transcend genre by mixing various styles into something new. Before STALAG 17 came along, the idea of a comedy about prisoners of war was almost unthinkable, and it is precisely the story’s sense of humor that gives it humanity and emotional resonance. The coping mechanisms we use to endure hardship on the level of the day-to-day ultimately speaks volumes more about the human experience than simply putting on a pageant of misery and despair. STALAG 17 also speaks to Wilder’s personal artistic preoccupations, continuing his career-long exploration of men as defined by their professions. This conceit naturally lends itself to surface fascinations with uniforms– particularly, the utilitarian designs employed by militaries. Even within the homogeneity of army uniforms, there’s class systems at play: grunts on the ground are issued unglamorous fatigues fit for fighting and manual labor, while officers appear comparatively regal in starched suits often festooned with medals and ribbons. Wilder’s work is always tangling with class conflict– when he isn’t detailing the plight of the middle-class common man in films like DOUBLE INDEMNITY or THE APARTMENT (1960), he’s pitting the rich and the poor against each other. STALAG 17 is a prime example of the latter conceit, drawing a stark contrast against the grimy, starving prisoners and their well-fed, warmly-dressed captors. Finally, Wilder’s depiction of these Nazi overlords alludes to his own victimhood under their reign– like the bumbling, buffoonish Germans found in A FOREIGN AFFAIR, the antagonists of STALAG 17 are painted as misguided fools ripe for mockery. This could be read as an understandable indulgence on Wilder’s part, using his film work as an outlet to work out his aggressions in the absence of an ability to physically confront those who devastated his family and his homeland. 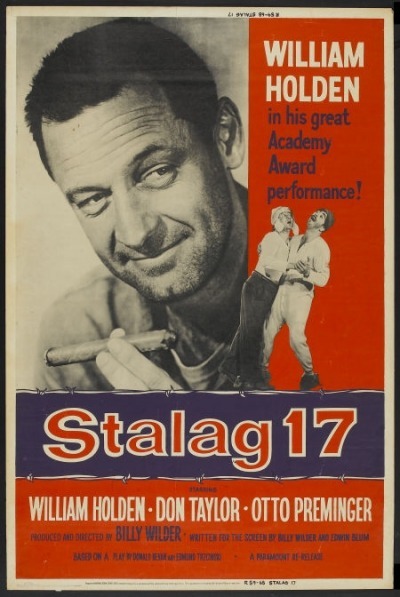 STALAG 17, like many of Wilder’s previous films, was an immediate financial and critical success, netting the venerated director yet another round of Oscar nominations for his producing and directing. Even today, the film is remembered as one of the greats within his filmography; an entry that finds Wilder operating at the top of his form. In this respect, STALAG 17doesn’t actually offer much in the way of Wilder’s artistic growth: he’s re-treading familiar narrative and thematic ground without coming to any new discoveries. STALAG 17’s legacy within Wilder’s canon is akin to treading water– but in the best possible meaning of the phrase. That being said, STALAG 17 does mark the beginning of the end for a distinct era in Wilder’s career: his partnership with Paramount, which extended all the way back to his first American feature THE MAJOR AND THE MINOR in 1942. Via a series of missteps and errors in judgment, the studio inadvertently and repeatedly bungled their relationship with him during production. For starters, they held STALAG 17 back from release for over a year, intimidated by the thought that audiences would find the film’s setting unfavorable. When they did finally release the film, it was as an exploitation picture– denied the “prestige film” treatment that had been accorded to his previous films (1). Combine that with some executives’ insensitivity to Wilder’s familial losses during World War 2, and their forcing him to give up his personal share of STALAG 17’s profits to help recoup the financial losses from ACE IN THE HOLE, and it’s no wonder that Wilder’s taste for the business relationship was beginning to sour (1). He’d hang on for another year, making one last feature (1954’s SABRINA) for the studio while he ran out the remainder of his contract. In the long run, Wilder’s dramatic exit from his longtime base of operations would amount to a mere bump in the road– his momentum was simply too fast to be derailed. Indeed, his sights were set to the horizon ahead, where many more iconic works were still waiting to be made. STALAG 17 is currently available on high-definition Blu Ray via Paramount.